I suppose you have often noticed how throughout the day bookmakers odds on different events changed several times. It is difficult to guess where the odds moves and how many points. Sometimes movement is limited only by one point, but sometimes it may reach eight to ten cents. We will try to understand in this post the reasons of the bookmakers line changes, as well as how to correctly use this. money on one of the results. Naturally, the gambling houses do not like it, when, for some not entirely clear reasons for them on one sporting event put a lot of money. First, it raises some suspicions, and secondly, the negative impact on the equalization of bookmakers profit. Quite logical bookmakers response to " large bets" certain odd is its dropping. The degree of dropping depends on the level of "huge wagers". There are two main causes of "dropping odds" : “amateur money” and “smart money”. In the first case odds are dropped operating by conventional sports betting fans. Odds dropping coused by “amateur money” typically formed by the spontaneous accumulation of money of the large number of players on one of the outcomes. If the amount is really big , it can make the bookies think about the feasibility of odd modifying. In addition to simple players playing without strategy, “amateur money” usually also involves small professional bettors consider that this odd is value. Often “amateur money” are operating on the match favorites. And this is done without any collusion , but simply because "the favorite must win ". 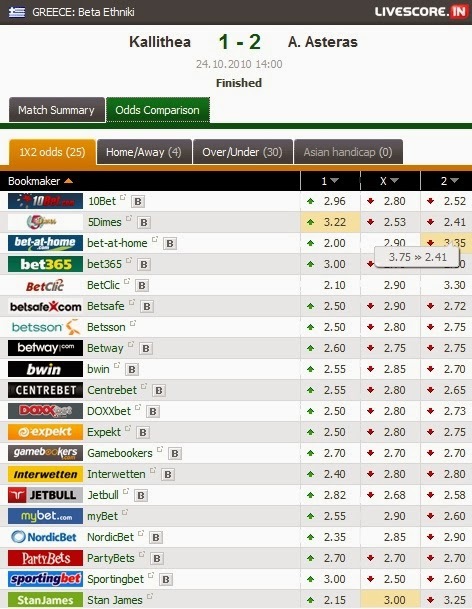 Bookmakers usually ignore “amateur money” when moving their odds or change the odds on one or two points, which is considered to be a minor change . Much more bookmakers fear "smart money " bets implemented by the major professional players , Cappers and members of syndicates . These people just will not bet for fun , and if a large amount of "smart money" loaded " on some outcome, bookies are trying to respond to these actions as quickly as possible. It is no secret that all bookmakers watching quotes each other , to be aware of dropping odds of their competitors. Usually in the case of simultaneous odds movement in several offices on two or three points , the rest bookmakers immediately try to trim odds to avoid becoming the next victim of “smart money”. Unlike “amateur money”, “ smart money " bends the odds immediately for at least four to five points. First, it raises some suspicions, and secondly, the negative impact on the equalization of bookmakers profit, of which has been much written in the post "THINK LIKE A BOOKIE! HOW BOOKIES MAKE MONEY", which you can find on my blog. Quite logical bookmakers response to " large bets" certain odd is its dropping. The degree of dropping depends on the level of "huge wagers".